Tyla recently pulled out her the Teddy Ruxpin she had when she was a kid and asked if I could get it to work. Thankfully she still had one of the tapes for it too and I was able to get it all working with just a fresh set of batteries. Our first thought was, “Wow! This thing must be worth a fortune!” It was such an iconic toy from the 80s. I looked it up and… nope. You can go to illiop.com to learn how to figure out what year your Teddy Ruxpin was created and estimate it’s value. If you have a mint condition Teddy Ruxpin with it’s original box, you might hope to get $100. Tyla’s has been played with but it still works so maybe we could get $50 out of it. In 1985, the bears sold for $69.95 (or $155 in today’s money). So keeping iconic childhood toys isn’t a great investment, especially when millions of them were produced, but it’s still a fun blast from the past. Elijah thinks it’s the coolest thing ever. 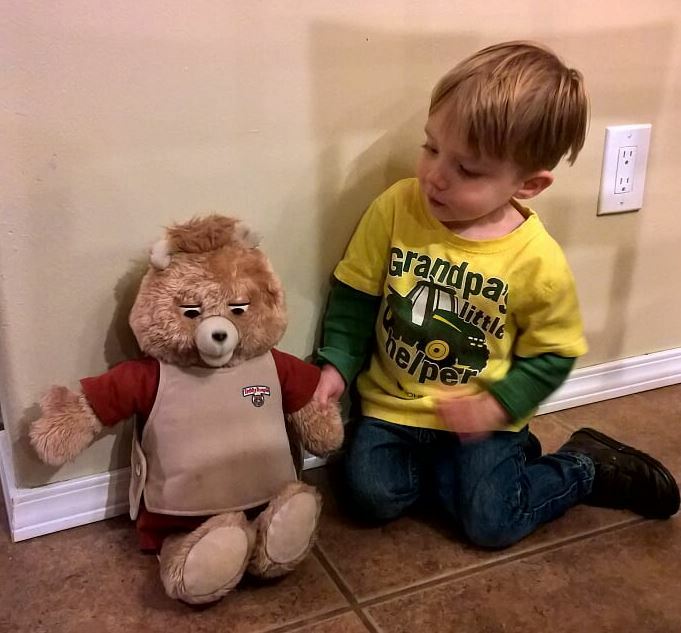 He sits on the floor and holds Teddy’s hand while Teddy sings songs.